The Football Association has launched its biggest survey into grassroots football as they look to invest a record £260m into the amateur game. Players, coaches, referees as well as staff and volunteers from a 400,000-strong grassroots football workforce are encouraged to take part. 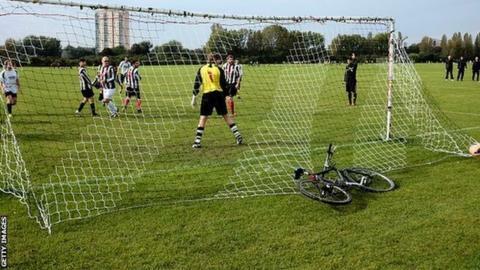 The FA plans to improve facilities and coaching, as well as increase the number of people taking part. "This is the FA listening to people," said FA spokesman Tony Snow. Recommendations outlined in Greg Dyke's chairman's commission sets out the ambition to build up to 150 football hubs in 30 cities, as well as a 50% increase in the total number of full-size, publicly accessible 3G artificial grass pitches across England, to over 1,000. "There are around 11 million people in this country who kick a ball around from playing in the local park to playing Sunday League matches," added Snow, communications manager on grassroots and coaching. "There are 27,000 referees and hundreds of thousands of volunteers from people who wash the bibs to driving players to away matches. "We want them all to take part in the survey which will lead us having an understanding of the changing needs of the football fraternity." The survey will run to 30 October and those involved involved in the grassroots game can contribute by clicking on this link.